Enthusiastic UCSC undergraduate volunteers got the party started even before alumni set foot on campus. Sammy the Slug kept a close watch on his many fans during an informal lunch at Porter College. Alumni rekindled old friendships and made new memories during the weekend festivities. 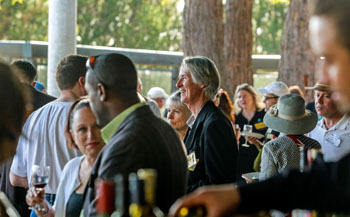 UCSC Chancellor George Blumenthal addressed the crowd at Saturday's lunch during Alumni Reunion Weekend. The party started before the prodigal Slugs even set foot on UC Santa Cruz. A group of student volunteers at the base of campus jumped, cheered, and urged alumni to honk their horns. They held banners that said, "We missed you!" and "Welcome to your happy place!" 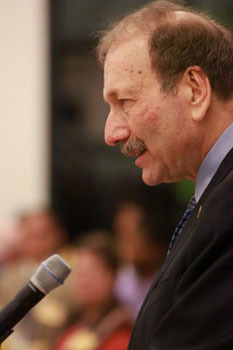 More than 1,000 revelers participated enthusiastically in all activities, whether they were immersing themselves in dream research, video games, and other topics at a special "Teach-In" event, honoring founding Oakes provost J. Herman Blake or memorializing his colleague, the beloved writing lecturer Don Rothman, attending the festive annual Dizikes Concert highlighting the Madrigals and a cappella groups, or taking off on a "Then and Now Alumni Walking Tour" leaving from Porter Circle. 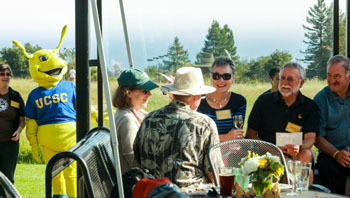 It was all part of this year's immersive UCSC Alumni Weekend festivities, which emphasized fun, informality, good vibes, friendship, food, and reinforced connections with friends and faculty. As returning alumni approached Porter College—where many events were scheduled this year—they heard the acoustic musical stylings of the Coffis Brothers before proceeding to a deliriously silly open-air "photo booth," where they tried on fuzzy banana slug hats, waved Slug banners, and tried on a Slug "mustache"a banana slug-shaped refrigerator magnet sprayed gold and mounted on a stick. They also contributed to the shared sense of nostalgia by contributing to an online photo album. Alumni also gathered around Porter College's famous koi pond—a powerful memory trigger for UCSC graduates. Jake Wickenheiser (Cowell '95, sociology) reflected on all the life-changing analytical skills he picked up as a student. He also had some words for the giant white-orange, black, violet, and gray fish, which swam right up to him as if recognizing and old, familiar face. "I used to feed you," he said, addressing one fish in particular. "You remember me?" The passage of time was a constant theme. "I definitely came to mark two decades," said Susan Cockerham (College Eight '93, biology) as she sat near the koi. "I told my dad I was coming back to Alumni Weekend. He said, 'What? It's only been five years since you graduated, right?' When I told him it was 20 years, he laughed maniacally!" Everyone was in a reflective mode, including Chancellor George Blumenthal, who reflected on some of the happiest moments at UCSC while addressing the crowd at the Banana Slug Lunch, held at Porter College. 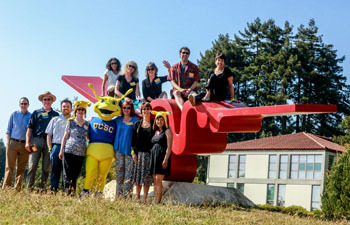 Among those highlights: the day in 1986 when students made the Banana Slug their official mascot, the first time he successfully biked all the way up UCSC's notorious hill, and, most of all, his chance to accompany astronomy professor Sandy Faber to the White House, where President Obama presented her with the National Medal of Science this February. Blumenthal also shared his list of UCSC highlights in a recent blog posting. After eating lunch, alumni said hello to Kendra Baker (Crown '01, language studies), co-owner of the highly successful locally based Penny Ice Creamery, who was on hand serving up scoops of strawberry pink peppercorn, Tahitian vanilla, and Verve coffee praline ice cream, with chocolate sorbet as a lighter option. One Slug sojourner, Charlene Paquette Moscovici (College Five [now Porter] '73, aesthetic studies), who went on to be a film actress and model, and worked for many years in the advertising industry, traveled from Paris, France. She said the campus and her years there, as well as her friendship with the late George Hitchcock, the legendary poet, painter, and creative writing lecturer, refined her aesthetic sense and changed the way she looks at the world. Other far-traveling Slugs did their best to extend the party. Elizabeth Heller (College Eight '03, theater arts), connected with Slugs in her graduating class via Facebook and arranged to rent a house in Santa Cruz during the weekend festivities. Her group of pals—flying in from as far away as Germany—made special commemorative T-shirts for the occasion.